Hawaii Medical Service Association is pioneering the nation's first online system that will open the way for Hawaii residents to have 24-hour access to local physicians via the Internet. » The online service will enable Hawaii residents statewide to enroll in the program for a fee to talk live to a local physician, specialist or other medical provider in HMSA's on-demand network via the Web or by e-mail or telephone. » Patients can access physicians without an appointment and without leaving home. » Consultations are immediate, secure and private, allowing doctors to virtually diagnose, prescribe and recommend follow-up care. » The consultation, along with other personal health information, can be transferred to primary care physicians with a click of the mouse. The state's largest health insurer has signed an agreement with Microsoft Corp. and Boston-based American Well Inc. to make it possible for patients statewide to receive real-time consultations with Hawaii physicians who participate in the program, HMSA announced yesterday. The virtual service, scheduled to launch in early 2009, will allow patients to talk live to a local doctor, specialist or other medical provider in HMSA's network via the Web, e-mail or by phone without an appointment. Patients with video-enabled computers also will be able to see a doctor during the consultation. HMSA did not disclose start-up costs for the program. The online health care system will allow doctors to diagnose and prescribe medication virtually around the clock for patients who will not have to leave home or the office. "This will improve access to health care statewide, fill an immediate need in Hawaii's health care industry and help with the health care access issues we face in some rural areas," said Michael Stollar, HMSA vice president of marketing and communications. The service will be secure, private and affordable, though HMSA declined to provide cost estimates since it has yet to work out details of the program. HMSA and Microsoft will offer online health care to all Hawaii residents, 24 hours a day, without an appointment, and without leaving home. HMSA is confident that Hawaii physicians, particularly younger doctors, will be motivated to participate in the new system for convenience and the potential to improve patient care and satisfaction. The health plan has yet to enroll physicians in the program, though it said that its success depends on physician support and participation. Besides enabling live communication between providers and patients, doctors will be able to review patient information, including health summaries from HMSA, and recommend follow-up care. 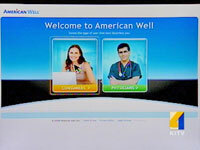 American Well is the developer of the online health care communications system, while Microsoft's HealthVault will allow consumers to collect, store and manage personal health information, including provider and hospital records, home monitoring devices and patient entries that can be shared with physicians, family and other third parties with a click of the mouse. HMSA said the virtual system will be as secure as online banking and other highly sensitive programs operated by companies worldwide.